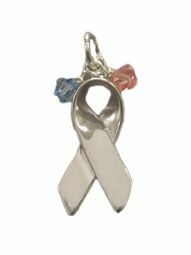 This Sterling Silver Support Ribbon charm really shows off your support for your cause! Select a chain below to wear this as a pendant for a very special necklace. Select up to TWO crystal colors, enter in box below. Turn this charm into a handbag charm, cell phone charm, car rearview mirror charm, or key charm by selecting a keychain option in the drop down box below. Select the Sterling Lobster Claw to make this charm easily hook onto and off of bracelets or zippers. Ask us if other colors are available for different causes!